Regular readers of this blog will know that I’m particularly interested in gender disaggregated data: indeed, my first blog post of 2017 was about how the growing increase in the availability of gender disaggregated data for ICT access and use was a trend I was excited to see for this year. This really matters. Reliable gender disaggregated statistics on mobile phone and ICT ownership, access, and usage in low- and middle-income countries are still limited, and aggregated data collection tends to mask gender differences. And so it’s difficult then to understand where exactly the gaps are in women’s access to, and use, of ICTs, and therefore difficult to understand how to plug those gaps. Gathering gender disaggregated data on ICT access and use is, in my opinion, the first step to reducing the gender digital divide; that gender digital divide that is holding women and girls back and not giving them access to the full opportunities that ICTs can bring. Part of the challenge in getting gender disaggregated data, however, has been not only the lack of standardised metrics to measure this, but also the lack of tools to help actually collect the data. 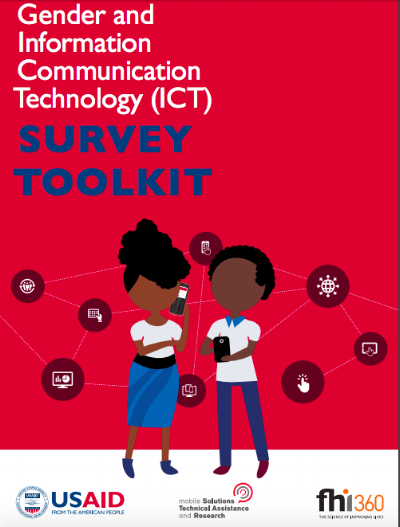 Which is why I’m so delighted to present the Gender and ICT Survey Toolkit, which I co-authored along with Katie Highet and Hannah Skelley of mSTAR, for USAID Digital Inclusion. You don’t need to be an M&E or research expert to use them; indeed, part of the problem with this lack of gender disaggregated data is that people often don’t have M&E skills and are unsure where to start. Rather, they’re designed to be practical and user-friendly, and can be adapted as needed and according to your comfort and your skill level. There’s an accompanying webinar run by the USAID team that introduces it in more detail - check it out here!